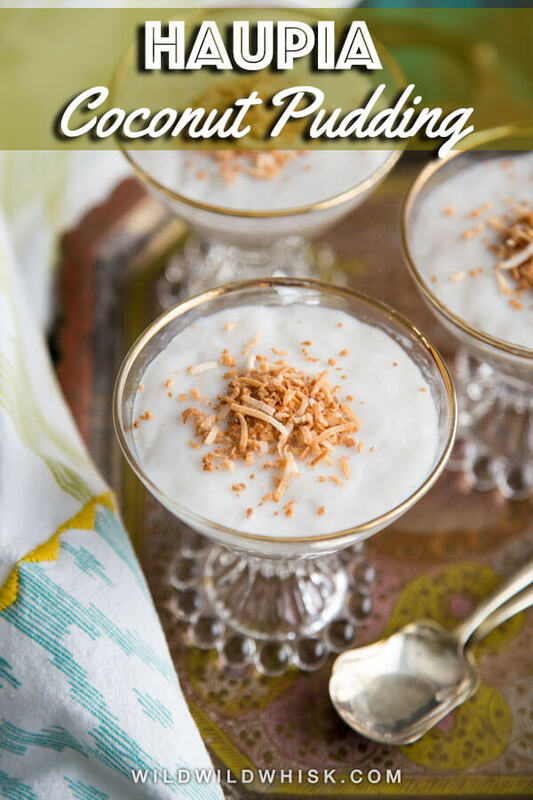 Haupia is an easy coconut pudding made entirely from coconut milk and thickened with cornstarch. 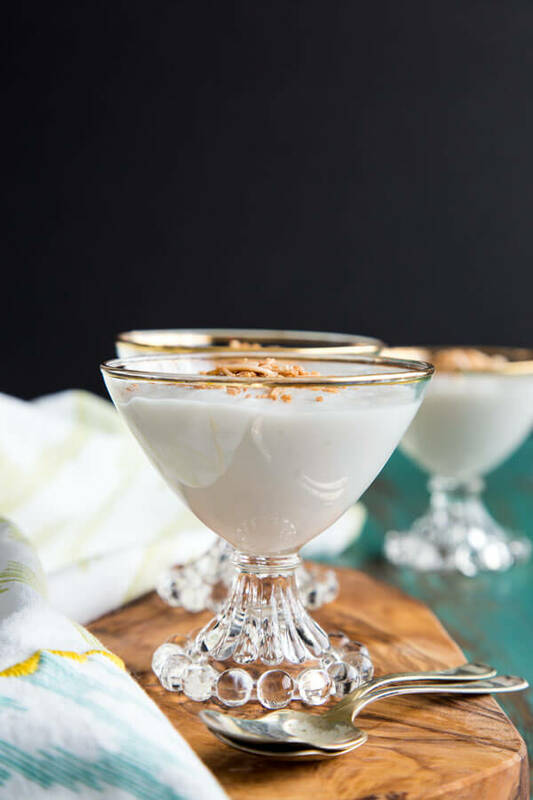 This simple treat is ridiculously good and quick to make. This small batch recipe can be scaled up easily to serve a big crowd. My first time encountering Haupia was from a McDonald’s on Maui. I know you’re probably thinking why on earth would you go to McDonald while vacationing on the island. But it’s kind of a special destination truly, you have to get the pies if nothing else from there. I’ve tried Haupia and Ube hand pies from there and I wish they would bring those to the mainland. Eventually I learned that Haupia is in almost everything, Haupia pie, Chocolate Haupia pie, Ube Haupia pie, Haupia cake, Haupia by itself… I can sit here and try to name them all, but let’s get to this recipe before the day is over. First of all, what is Haupia? 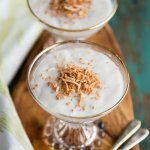 Haupia is a coconut milk base Hawaiian dessert. 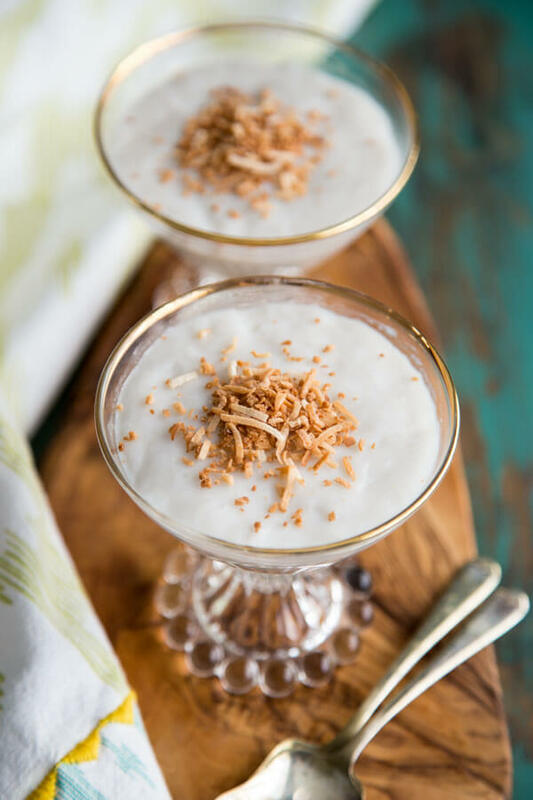 In this Haupia recipe, coconut milk is thickened with cornstarch to a pudding consistency and served in cups. I believe traditionally the pudding is cooked longer to an almost gelatin consistency, and then served in blocks like jello dessert based on an older Hawaiian dessert cookbook I own. I have not seen it otherwise. I prefer the presentation in the serving cups but will give you both options for making this recipe. 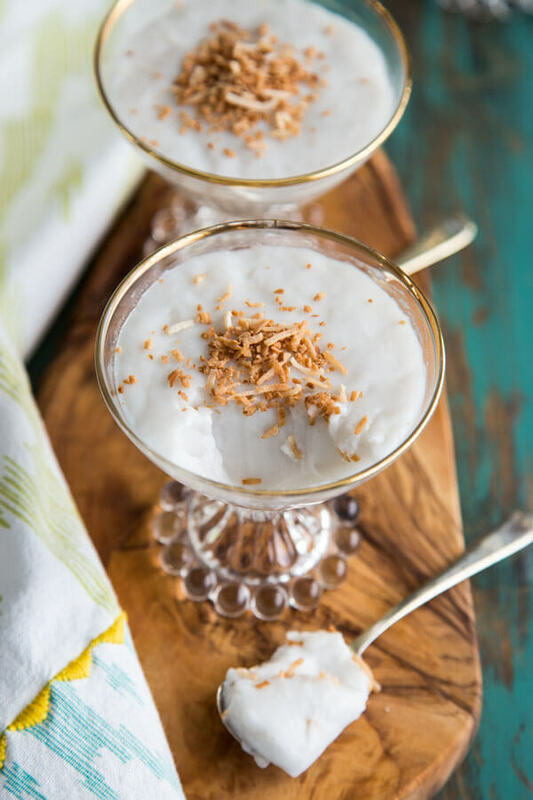 I use full fat coconut milk from a can. 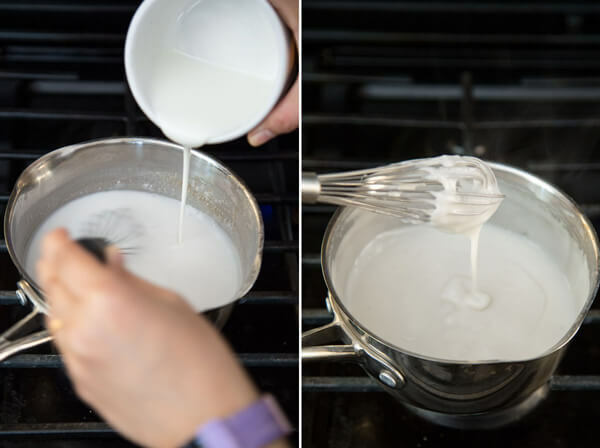 Whisk the cornstarch into a little bit of the cold or room temperature liquid to dissolve until smooth. 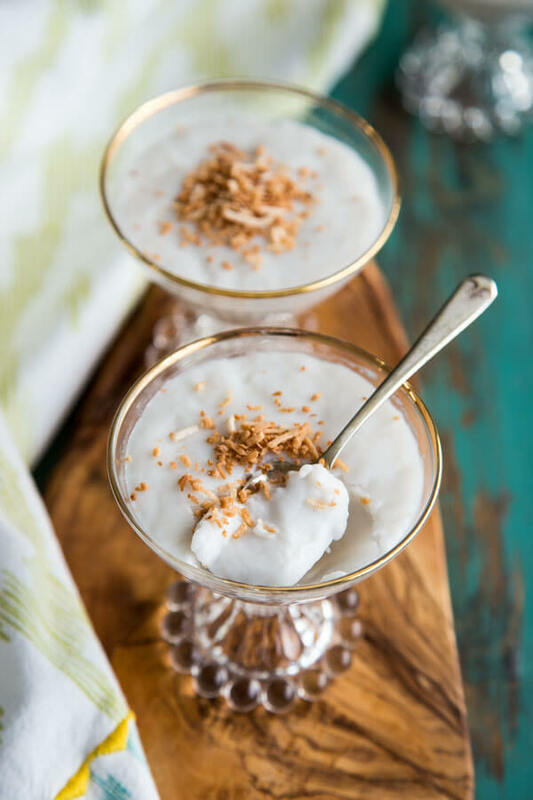 Heat the rest of the coconut milk with sugar and salt in a sauce pan over medium heat until simmering before streaming the cornstarch mixture into the hot liquid. Stir continuously until the liquid thickens, this should take only a few minutes. At this point, you can transfer the pudding to serving cups, allow them to cool to room temperature and refrigerate further before serving. If you want to make the gelatin like Haupia, continue to cook for another 7 – 10 minutes until the mixture turns translucent and it seems to want to stick together in one big blob. Not quite a scientific description but if you just stick to cooking it for at least a total of 10 minutes after you stream in the cornstarch, this should work. You can transfer this to a small loaf pan, allow it to cool and then refrigerate to set further before cutting it up. For garnish, I like to toast some sweetened shredded coconut in a skillet until lightly brown and sprinkle over the Haupia. You can use this garnish for both the pudding cup and the hard set pudding cut into squares. Keep the pudding refrigerated and consume within the week. The longer they are kept in the fridge the harder they will become and will also lose their flavor, so it is best to eat them within a short time. Add the cornstarch to 1/4 cup of the coconut milk and stir until dissolved. Add the rest of the coconut milk to a small sauce pan along with the sugar and salt. Cook over medium heat until all of the sugar dissolves. Slowly stream in the cornstarch mixture while whisking and continue to cook stirring constantly. 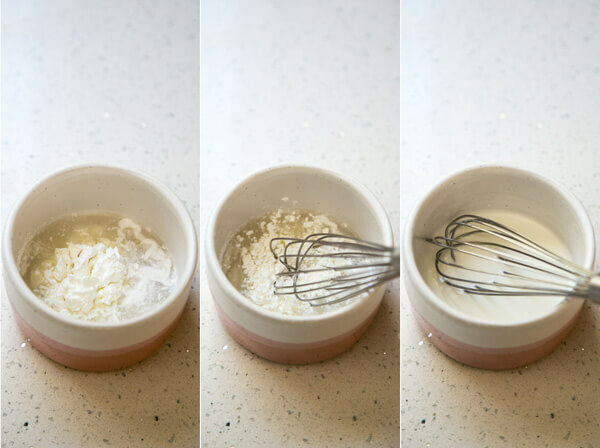 Cook the mixture for just a few (2 - 3) minutes until thicken. 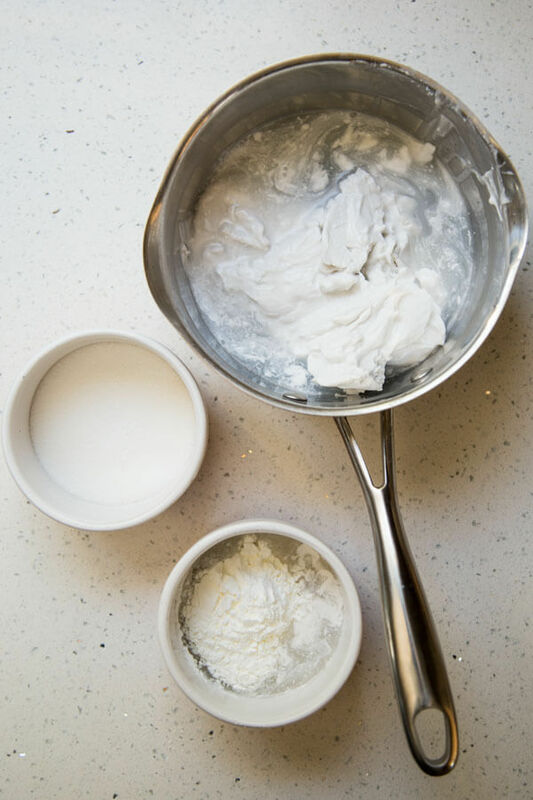 Pour pudding into 3 or 4 small serving cups or ramekins, let cool to room temperature and then refrigerate to set further if desired, 1 - 2 hours. Cook the mixture for at least 10 minutes after adding in the cornstarch, stirring constantly. The mixture will turn more translucent and will want to stick together in one big blob. Line a loaf pan with a piece of parchment paper, allowing the ends to drape over the side of the pan. Pour pudding into the loaf pan, using a spatula to scrape as necessary. Let cool and then refrigerate to set further, 2 - 4 hours. Cut into blocks before serving, this could yield 8 - 10 smaller snack size portions depending on how you cut it. 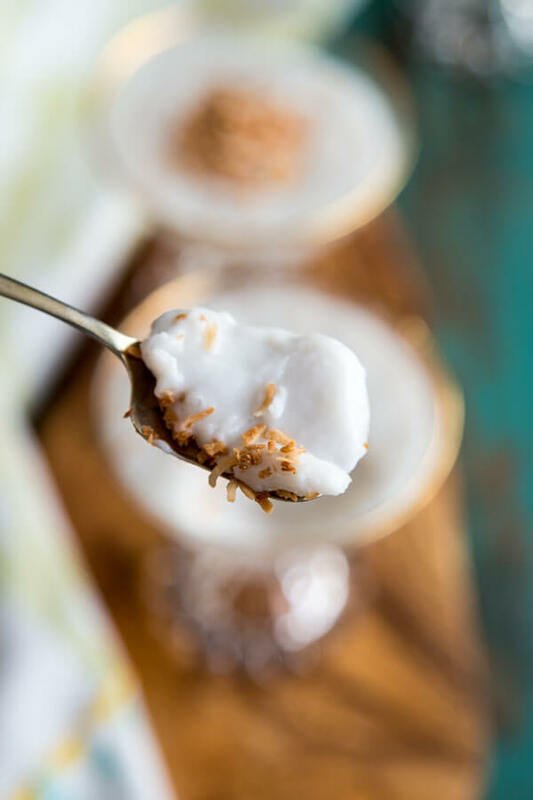 Toast the sweetened shredded coconut in a skillet over medium heat until lightly brown and fragrant. Sprinkle about 1 teaspoon over the haupia cup just before serving. If making hard set haupia, I recommend doubling the recipe to get thicker squares when cut. One batch of this recipe yields a thinner layer of less than 1/2” when set in a 9”x5” loaf pan. So doubling will yield a more substantial thickness. Or you can use a smaller container like a tupperware to set it in. Oooooo I wanna try this!! It’s so easy to make, I hope you’ll love it!